Earlier this month at the annual AGM Reliance Jio chairman introduced JioPhone offer dubbed as “Monsoon Hungama” that allows feature phone users exchange their phone for a new JioPhone at an effective price of Rs. 501 instead of paying the full amount of Rs. 1500. Today the company has announced more details about the offer and also introduced a special plan for these users. Under the Monsoon Hungama exchange offer Jiophone will now be available at effectively Rs 501. Additionally, Rs 501 is also a 100% refundable security deposit at the end of 3 years, thereby making the JioPhone effectively fre. Monsoon Hungama is a combined offering of a JioPhone at effectively Rs 501 and unlimited voice and 90GB data (0.5GB data/day) over a period of 6 months, on recharge of Rs. 594 at the time of activation. 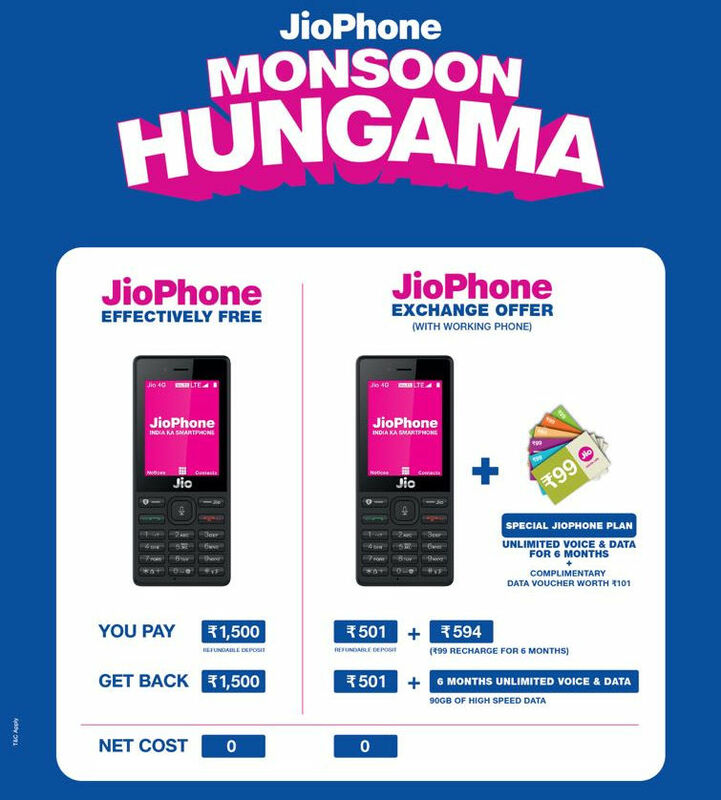 Additionally JioPhone users under the Monsoon Hungama exchange offer will get a special exchange bonus of 6GB data voucher, worth Rs. 101.